Baku (Azerbaijani: Bakı), sometimes known as Baqy, Baky, or Baki, located on the western shore of the Caspian Sea, is the capital, the largest city, and the largest port of Azerbaijan. The existence of petroleum in Baku has been known since the eighth century, and in the tenth century, the Arabian traveler Marudee reported that both white and black oil were being extracted naturally there. By the fifteenth century, oil for lamps was obtained from hand-dug surface wells. In 1823, the world's first paraffin factory was built there, and in 1846, the world's first oil well was drilled in Bibi-Heybat. Javad Melikov from Baku had built the first kerosene factory in 1863. Petroleum remains the basis of Baku's economy. The city entered a period of decline after the break-up of the Soviet Union, but has since recovered. While Azerbaijan has a high literacy rate, with a per capital GDP of $4,601 in 2005, its oil wealth had not benefited most citizens. Azerbaijan shares the problems of the former Soviet republics in making the transition from a command to a market economy. During Soviet times, Baku was a vacation destination where citizens could enjoy beaches or relax in now-dilapidated spa complexes overlooking the Caspian Sea. However, scientists consider the Apsheron Peninsula (including Baku and Sumqayit), and the Caspian Sea, to be the ecologically most devastated area in the world because of severe air, soil, and water pollution. Soil pollution results from oil spills, from the use of DDT as a pesticide, and from toxic defoliants used in the production of cotton. These issues of pollution pose challenges to economic development as well as to the health of the people and the environment. Destruction of the environment for economic means reflects shortsightedness and lack of understanding of the importance of the environment in the sustenance of humanity, not only in Baku, but wherever it occurs. Old city and soviet-era buildings. Street in oil boom-era Baku. The name Baku is derived from the old Persian Bagavan, which translates to "City of God." The folk etymology explains the name Baku as derived from the Persian Bādkube (بادکوبه ), meaning "city where the wind blows," due to frequent winds blowing in Baku. However, the word Bādkube was invented only in sixteenth to seventeenth centuries, whereas Baku was founded before the fifth century C.E. Located on the southern shore of the Absheron Peninsula, on the wide Bay of Baku, and sheltered by the Baku Archipelago, the coastal terrain around Baku lies as much as 92 feet (28 meters) below sea level. Around the city there are a number of mud volcanoes (Keyraki, Bogkh-bogkha, Lokbatan and others) and salt lakes (Boyukshor, Khodasan). The climate is hot and humid in the summer, and cool and wet in the winter. During the winter, gale-force winds sweep through on occasion, driven by masses of polar air. Strong northern winds (known as Khazri) and southern winds (Gilavar) are typical. Snow is rare, and temperatures on the coast rarely drop to freezing. The temperature for January is 33.8°F (1°C) and in July 82.4°F (28°C). The southwestern part of Great Baku is a more arid part of Azerbaijan, where precipitation is less than six inches (150mm) a year. Land area totals 100 square miles (260 square kilometers). During Soviet times, Baku was a vacation destination where citizens could enjoy beaches or relax in now-dilapidated spa complexes overlooking the Caspian Sea. However, scientists consider the Apsheron Peninsula (including Baku and Sumqayit), and the Caspian Sea, to be the ecologically most devastated area in the world because of severe air, soil, and water pollution. Soil pollution results from oil spills, from the use of DDT as a pesticide, and from toxic defoliants used in the production of cotton. 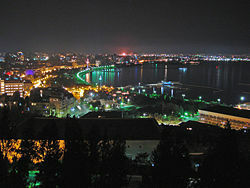 Modern Baku consists of three parts: The Old Town (İçəri Şəhər), the boomtown, and the Soviet-built town. 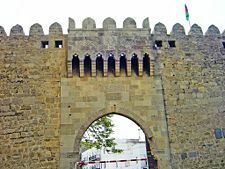 The center of Baku is the old town, which is also a fortress. 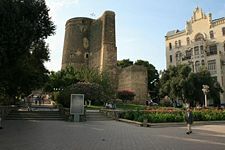 In December 2000, the Inner City of Baku with the Palace of the Shirvanshahs and Maiden Tower became the first location in Azerbaijan classified as a World Heritage Site. UNESCO's justification for the listing states: "The Walled City of Baku represents an outstanding and rare example of an historic urban ensemble and architecture with influence from Zoroastrian, Sassanian, Arabic, Persian, Shirvani, Ottoman, and Russian cultures." Most of the walls and towers, strengthened after the Russian conquest in 1806, survived. This section is picturesque, with its maze of narrow alleys and ancient buildings: The cobbled streets past the Palace of the Shirvanshahs, two caravansaries (ancient inns), the Maiden Tower, the baths, and the Juma Mosque. The old town has dozens of small mosques, often without any particular sign to distinguish them from the next building. More than 225 names of streets have been changed since 1988, in an attempt to erase links with the former Soviet Union. 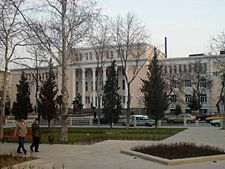 The first street to be built outside the Inner City, originally called Nikolayevskaya after Nicolas I, was renamed to Parlaman Kuchesi, because the Parliament of Azerbaijan Democratic Republic held its meeting in a building located at that street. During the Soviet era, it became Kommunisticheskaya Ulitsa. Now it is called İstiqlaliyyet Kuchesi, celebrating Azeri independence. 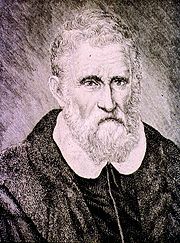 Marco Polo, who wrote of Baku oil. Prince Pavel Tsitsianov was killed when he tried to make Baku surrender. The Maiden Tower in old Baku. Panorama of Baku by Engelbert Kaempfer. 1683. Icheri Sheher-an old inner city of Baku. Baku in the early 1900s. Gates to the Old City. 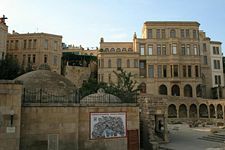 Baku was inhabited during the Stone Age, up to 100,000 years ago, and possibly a Bronze settlement existed there. Roman inscriptions dating from 84 C.E. to 96 C.E. were discovered near Baku, in Gobustan. The apostle Bartholomew identified Baku as Albana. Local church traditions record the belief that Bartholomew's martyrdom occurred at the bottom of the Maiden Tower within the Old City, where a Christian church was built on the site of the pagan Temple of Arta. 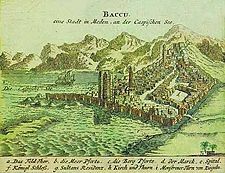 The fifth century historian Priscus of Panium mentioned the famous Bakuvian fires, the presence of which meant Baku became a center of ancient Zoroastrianism. The earliest numismatic evidence found in the city is an Abbasid coin dating from the eighth century C.E. During this time Baku was a domain of the Arab Caliphate and later of Shirvanshahs, a Persianized dynasty of Arabic origin, who established a native Azeri state and were rulers of Shirvan, a historical region in present-day Azerbaijan. Baku frequently came under assault from the Khazars, a semi-nomadic Turkic people who dominated the Pontic steppe and the North Caucasus from the seventh to the tenth centuries, and starting from the tenth century, by the Rus, a medieval state centered on Kiev, from 880 to the middle of the twelfth century. Shirvanshah Akhsitan I built a navy in Baku, and in 1170, he repelled another Russian assault. After a devastating earthquake struck Shamakhy, the capital of Shirvan, in 1191, Shirvanshah’s court moved to Baku. A mint began operation. Hulagu Khan occupied Baku under the domain of the Shirvan state during the third Mongol campaign in Azerbaijan (1231-1239), and it became a winter residence for Ilkhanids. Marco Polo (1254–1324) wrote of Baku oil exports to Near Eastern countries. Between the twelfth and the fourteenth centuries, the city walls were rebuilt and strengthened. The Maiden Tower, the castles of Ramana, Nardaran, Shagan and Mardakan, and also the famous Sabayel castle on the island of the Baku Bay, were built during this period. Unfortunately, the rising level of the Caspian Sea engulfed much of the city and the famous castle of Sabayel went into the sea in the fourteenth century. In 1501, Safavid Shah Ismail I besieged Baku. At this time the city was enclosed with strong walls with the sea on one side and protected by a wide trench on the land sides. In 1540, Safavid troops recaptured Baku. In 1604, the Iranian Shah Abbas I destroyed the Baku fortress. Peter the Great of Russia captured Baku on June 26, 1723, after a lasting siege using cannons. The soldiers of two regiments (2382 people) were left in the Baku garrison. By 1730, the successes of the Shah of Iran, Nadir Shah, (1698-1747) in Shirvan forced the Russians to make an agreement near Ganja on March 10, 1735, and Russian troops withdrew from the city. In 1795, Agha Muhammad Khan Qajar (1742-1797) invaded Baku to defend against tsarist Russia's policy of subduing the South Caucasus. In the spring of 1796, Baku surrendered to General Zubov of Russia, and General Pavel Tsitsianov was appointed the Baku's commandant. In March, 1797, tsarist troops left Baku. Russian forces, led by Tsitsianov, attempted to besiege Baku during the third Russo-Persian War (1804-1813). Tsitsianov was killed in February 1806, by Huseyngulu khan of Baku, near the city gates during the presentation of the city’s keys to him. 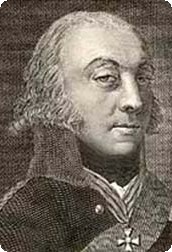 Baku was finally occupied by Russian forces, led by General Bulgakov, in September 1806, and Husayn Quli Khan was forced into exile. The Treaty of Gulistan, in 1813, meant Baku was absorbed into the Russian Empire. On July 10, 1840, the Baku uyezd was turned into an administrative region of the Russian Empire. The existence of petroleum in Baku has been known since the eighth century, and in the tenth century, the Arabian traveler Marudee reported that both white and black oil were being extracted naturally there. By the fifteenth century, oil for lamps was obtained from hand-dug surface wells. In 1823, the world's first paraffin factory was built there, and in 1846, the world's first oil well was drilled in Bibi-Heybat. Javad Melikov from Baku had built the first kerosene factory in 1863. In 1871, an oil leaseholder named Mirzoyev built the first wooden oil derrick. Drilling was conducted primitively with balance arm, whim, and manual pump. 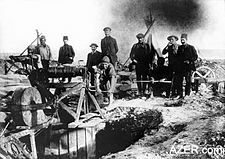 Large-scale oil development began in 1872, when the Russian imperial authorities auctioned the parcels of oil-rich land around Baku to private investors. Soon, Swiss, British, French, Belgian, German, Swedish, and American investors appeared in Baku, including Nobel brothers and Rothschilds, and an industrial oil belt, better known as Black City, was established near Baku. Beginning from the 1890s, Baku provided 95 percent of the oil production in the Russian Empire, and approximately half of world oil production. Medieval seaside fortifications were demolished in 1861, to allow for the creation of the port and a customs house in the quay. Baku became a center of the eponymous province after the devastating earthquake of 1859, in Shamakha. From 1914 to 1917, Baku produced 28,683,000 tons of oil, which constituted 15 percent of world production at the time. Germany did not trust Turkey in oil matters and transferred General Friedrich Freiherr Kress von Kressenstein from the Middle Eastern front with his troops to Georgia in order to enter Baku, through Ukraine, the Black Sea, and Georgia. Great Britain, in February 1918, sent General Lionel Dunsterville with troops to Baku through Anzali to block the German troops. 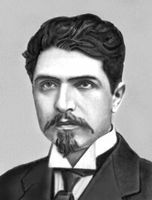 In 1917, after the October revolution, in the turmoil of the ongoing World War I and the breakup of the Russian Empire, Baku came under the control of the Baku Commune led by a veteran Bolshevik, Stepan Shaumyan (1878-1918). Seeking to capitalize on inter-ethnic conflicts, by spring 1918, Bolsheviks inspired and condoned civil warfare in and around Baku. During the infamous March Days, using the support of the Dashnak Armenian militia in the city, and under the pretext of suppressing the Musavat party, Bolsheviks attacked and massacred thousands of Azeris and other Muslims in Baku. On May 28, 1918, the Azerbaijani faction of the Transcaucasian Sejm proclaimed the independent Azerbaijan Democratic Republic (ADR) in Ganja. Azerbaijani forces, with the support of the Ottoman Army of Islam led by Nuru Pasha (1881-1949), started their advance onto Baku, eventually capturing the city from the loose coalition of Bolsheviks, Esers, Dashnaks, Mensheviks, and the British forces under the command of General Dunsterville on September 15, 1918. Thousands of Armenians in the city were massacred in revenge for the earlier March Days. Defeated Turkey withdrew its forces from Azerbaijan in the middle of November 1918. Headed by General William Thomson, 5000 English soldiers arrived in Baku on November 17, and martial law was imposed. In February 1920, the First Congress of the Communist Party of Azerbaijan took place in Baku and prepared for an armed revolt. On April 28, 1920, the 11th Red Army invaded Baku and reinstalled the Bolshevik power. Baku became the capital of Azerbaijan Soviet Socialist Republic. Since 1921, the city was headed by the Baku City Executive Committee, commonly known in Russian as Bakgorispolkom. On February 8, 1924, the first tram line and, two years later, the electric railway Baku-Surakhany—the first in the USSR—started to operate. The first buses appeared in Baku in 1928. 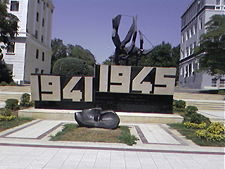 A monument to Azeri contribution to the Eastern Front in Baku. Its eternal fire is no longer lit. During World War II (1939-1945), Allied generals considered bombing Baku to wreck the supply of oil and thereby weaken the Soviet Union. During the Soviet-German War, 10 defense zones were built around the city to prevent possible German invasion, planned within the Operation Edelweiss. Adolf Hitler, the leader of Nazi Germany, said: "Unless we get Baku oil, the war is lost." The World War II Battle of Stalingrad, which took place between July 17, 1942, and February 2, 1943, was fought to determine who would have control of the Baku oil fields. During World War II, the growing demand for oil pushed Baku oil workers to reach record levels of extraction—23,482 million tons. The first oil platform in the world, originally called "The Black Rocks," was built in 1947, within the city's metropolitan area. In 1960, the first Caucasus house-building plant was built in Baku, and on December 25, 1975, the only plant producing air-conditioners in the Soviet Union began operation. In 1964–1968, the level of oil extraction rose 21 million tons per year. By the 1970s, Azerbaijan became one of the largest producers of grapes, and a sparkling wine factory was constructed in Baku. In 1981, a record quantity of 15 billion cubic meters of gas was extracted in Baku. Towards the end of the twentieth century, much of the onshore petroleum had been exhausted, and drilling had extended offshore. In 1991, following the collapse of the Soviet Union, and the Bakgorispolkom, the first independent city mayor Rafael Allahverdiyev was appointed. Azerbaijan is a presidential republic, in which the legislative and judicial branches have only limited independence. The president is an absolute ruler. Demonstrations are often suppressed with violence, there are reports of torture, and a strong censorship exists. Although Azerbaijan is a member of human rights bodies, several independent bodies, such as the Human Rights Watch, have deemed human rights there to be sub-par at best. Democratic and personal freedoms have been diminished by the government, wary of revolutions in Central Asia spreading to home turf. Elections there have widely been contested as fraudulent and seriously flawed. Baku is divided into eleven administrative districts, or raions (Azizbayov, Binagadi, Garadagh, Narimanov, Nasimi, Nizami, Sabail, Sabunchu, Khatai, Surakhany, and Yasamal), and 48 townships. Among these are the townships on islands in the Baku Bay and the town of Oil Rocks, built on stilts in the Caspian Sea, 37 miles (60km) away from Baku. Business buildings at Jafar Jabbarli St.
Baku International Airport named after Heydar Aliyev. The basis of Baku's economy is petroleum. Azerbaijan produces about 800,000 barrels of oil per day and 1 bcma of gas—with an historical peak of 1.2 million barrels per day by 2008 with equally large amount of gas expected. The Baku-Tbilisi-Ceyhan pipeline, opened in 2006, transports crude oil 1094 miles (1760km) from the Azeri-Chirag-Guneshli oil field in the Caspian Sea to the Mediterranean Sea. The oil is pumped from the Sangachal Terminal close to Baku, via Tbilisi the capital of Georgia, to Ceyhan a port on the south-eastern Mediterranean coast of Turkey. The oil economy of Baku underwent a resurgence in the early years of the twenty-first century, with the development of the massive Azeri-Chirag-Guneshli field, development of the Shah Deniz gas field, and the expansion of the Sangachal Terminal. The old Inturist Hotel was one of Baku's largest, was renovated, but overshadowed by the newer Hyatt Park, Hyatt Regency, Park Inn and Excelsior. Industries in Baku produce equipment for the oil industry. The city is the location of metalworking, shipbuilding and repair industries, the manufacture of electrical machinery, the production of chemicals and construction materials, and food processing. 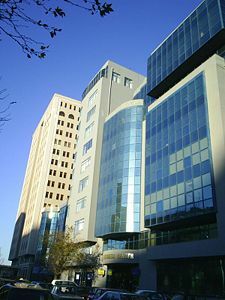 The Baku Stock Exchange has been operating since February 2001. Azerbaijan's per capital GDP was $4601 in 2005, ranked 106 on a list of 181 countries. Baku is served by the Heydar Aliyev International Airportand the Baku Metro. There were once trams. There are two official taxi companies in the city: the yellow Star cabs and the white taxis with blue sign from "Azerq Taxis." The van buses stop at any point along that route when flagged down or told to stop. Shipping services operate regularly from Baku across the Caspian Sea to Turkmenbashi (formerly Krasnovodsk) in Turkmenistan and to Bandar Anzali and Bandar Nowshar in Iran. In 2005, the population of Baku was 2,036,000 of whom 153,400 were internally displaced persons and 93,400 refugees. More than 90 percent of the population of Baku are ethnic Azerbaijanis. Up to 1988, Baku had very large Armenian, Russian, and Jewish populations. The official language of Azerbaijan is Azerbaijani, a member of the Oghuz subdivision of the Turkic language family. Russian is commonly spoken as a second language among the urbane. Two percent of the population speaks Armenian, and 6 percent speak other languages. The new Azerbaijan constitution grants religious freedom and asserts that there is no state religion. 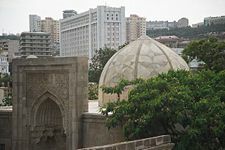 More than 94 percent of the residents of Baku practice various forms of Islam (vast majority Shia). About four percent are Christians (majority Russian Orthodox Church, Georgian Orthodox Church, and Molokans). 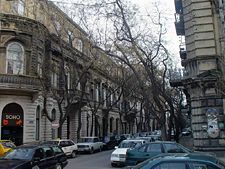 Baku has three different Jewish communities, namely the Ashkenazim Jews, the Mountain Jews, and the Georgian Jews. Under Communism, the Soviets took most Jewish property in Baku and Kuba. Since the collapse of the Soviet Union, Azerbaijani President Heydar Aliev has returned several synagogues and a Jewish college nationalized by the Soviets, to the Jewish community. As Azerbaijan's center of education, Baku boasts many universities and vocational schools. After Azerbaijan gained independence, the fall of Communism led to development of a number of private institutions. 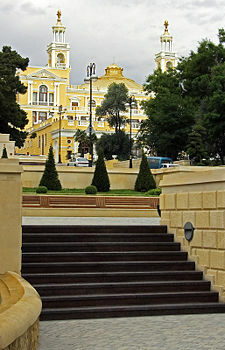 Baku also houses the Academy of Sciences of Azerbaijan founded in 1945. Public universities include: Azerbaijan Medical University, Azerbaijan State Economic University, Azerbaijan State Oil Academy, Azerbaijan Technical University, Azerbaijan University of Languages, Azerbaijan Architecture and Construction University, Baku Academy of Music, Baku Slavic University, and Baku State University. Baku has vibrant theater, opera and ballet. The main movie theatre is "Azerbaijan Cinema." The Azerbaijan State Academic Opera and Ballet Theatre is one of the most ornate music halls in the city. The State Philharmonic Hall with excellent acoustic conditions often holds performances outside. The Carpet and Applied Arts Museum exhibits the carpets from all periods, styles and from both Azerbaijan proper and the Azeri provinces in Iran. 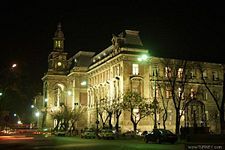 Baku also houses the country's largest art museum—Azerbaijan State Museum of Art, a depository of both domestic and foreign works of art, Western and Eastern. Heydar Aliyev Palace is one of the main venues featuring sizable performances. 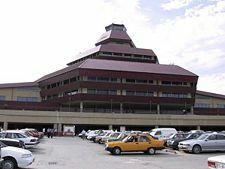 Some of the most popular discotheques and night clubs include, X-Site, Capitol Night Club, Le Chevalier at Europa Hotel, Zagulba Disco Club, and Le Mirage. Most bars are located near Fountain Square and are usually open until the early hours of the morning. There are several British and Irish style pubs, among them Corner Bar, Shakespeares, Finnigans, the Rig Bar, O'Malley's, and the Phoenix Bar. There is also a Jazz Club. The Baku International Jazz Festival is organized annually. Notable beaches include Shikhovo and One Thousand and One Nights. Baku has produced a number of notable figures in the sciences, arts and other fields. Notable scientists include: Soviet space program head Kerim Kerimov, winner of the Nobel Prize in Physics of 1962 Lev Landau, fuzzy logic inventor Lotfi Zadeh, and philosopher Max Black, cellist Mstislav Rostropovich, and world champion chess grandmaster Garri Kasparov. ↑ Administrative, density and territorial units and land size by economic regions of Azerbaijan Republic for January 1. 2007. Archived from the original on 2007-11-24. Retrieved 2009-07-17. ↑ Population by economic and administrative regions, urban settlements at the beginning of the 2009. Retrieved November 21, 2009. Kazemzadeh, Firuz. 1951. The Struggle for Transcaucasia, 1917-1921. New York: Philosophical Library. Suny, Ronald Grigor. 1972. The Baku Commune, 1917-1918; Class and Nationality in the Russian Revolution. Princeton, N.J.: Princeton University Press. ISBN 9780691051932. This page was last modified on 9 May 2016, at 18:29.